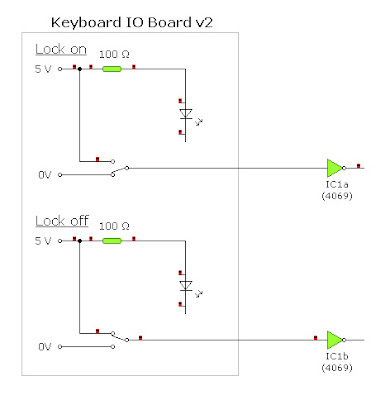 Here is some further detail on the keyboard -> 4069 Inverter IC's. 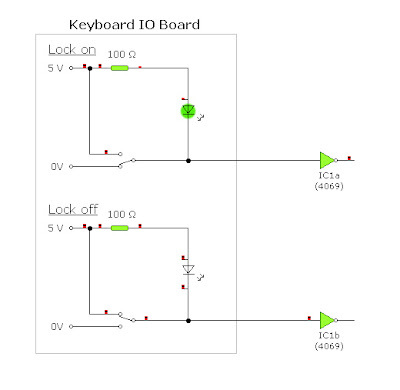 Within the grey border is a simulated circuit for a Caps/Num/Scroll lock LED circuit. The "switch" is controlled by the PC, using the Caps/Num/Scroll lock keys. When the switch is held LOW, the LED lights, and the inverter also switches on. When the switch is held HIGH, the LED turns off as their is no voltage difference between its (+) and (-) terminals and the inverter switches low. The 100 Ohm Resistor is a guess, and there to stop the LED blowing. As described above, the circuit is just a simulation of what would be read with a multimeter across the pins of the LED. In the final circuit (above), I removed the LED's, leaving their connection open-circuit, so essentially, the top of each of the diagrams can be ignored. This does not negatively effect the operation of the circuit.